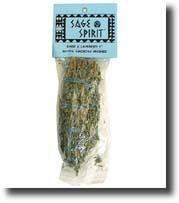 Sage Spirit Smudge Wands are made from a combination of sage, lavender and copal. "Smudging" is the name given to the burning of these sacred herbs for cleansing and praying. Each of these ingredients is considered a sacred herb by Native Americans, who have used these wands for generations in the smudging ceremony. A Prepack is also available. Small Wands are 5; wrapped with 100% cotton string.